Another shot in the dark after reading about them on power pop web-based publications like fufkin.com. I liked what I heard streaming over Not Lame's web site, so I bought it on Amazon. Now I know you're saying -- who are these guys? This was a major label album, on Warner Brothers, that received zero promotion or push, and disappeared faster than a sinking stone. Debuting smack in the middle of boy band fever, Taxiride looks like they were packaged the same way because, hey, four guys singing, just like The Backstreet Boys! However, the only things they had in common were the same gene set. Taxiride was signed out of Melbourne, Australia, and it was probably Warners' hope that four good looking guys could ride that N' Sync fad. Just a listen to the very first song from the debut album Imaginate, and you knew this was not some manufactured pseudo hip-hop or heavy ballad silliness. Warners recruited master mixer and producer Jack Joseph Puig to put the polish on these boys. "Can You Feel" was all acoustic guitars and four part harmonies, like a modernized Crosby, Still & Nash, with no drums, bass or keyboards, and rather enveloping to the ears. The killer song was "Everywhere You Go," which is really the perfect pop rock song, blending acoustic and electric guitars, all those great vocals, production ear candy courtesy of Puig, and the full band playing. 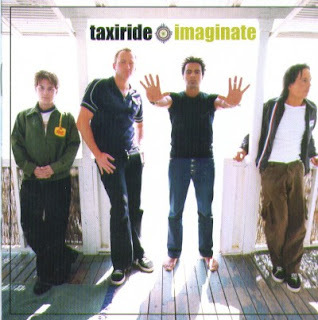 And unlike boy bands, who had the Swedish pop machines creating all their material, Taxiride wrote all of their own material. In learning how to mix over the years, the mantra you hear over and over again is "make it exciting," and this song is definitely a Puig masterclass. If you've heard similar Goo Goo Dolls tune "Slide," which Puig also did the honors, the instruments and vocals have their own space, each one EQ'd precisely in the sound field, everything just builds up from a simple guitar strum, smooths out in the break, subtle use of delays during the second chorus, and little counter reactions to the beat that take over your mind and you don't even realize it. I played "Everywhere You Go" for my daughter in my car a few years ago, and she made me repeat it a few times immediately, then requested I burn it for her on a CD. That's how addicting a great all around pop rock song can be. Taxiride's success may have been contained strictly in Australia, and Imaginate relegated immediately to the cut-out bins, they've left us this hidden musical gem. Strangely enough, the song's official video has a "rougher mix," which seems to have pushed the acoustic guitars back or out altogether, and put the "telephone EQ" effect for the intro. So you should definitely listen to the original version here and then check out the video version below.